Hi there! This is Hannah, from Fanciful Spaces, today I’m bringing you a really fun and exceptionally untraditional holiday card! I LOVE Kat’s Naughty Christmas Stamp and Matching Die Set! There are so many fun sentiments in this set, and the fact that it comes with a die really is awesome. I might have to invest in some naughty handcuffs for some more photo props because I’ll be having a lot of fun with this set! I started by taking two sheets from the Knit Picky Petite Paper by Lawn Fawn, and die cutting them with Cross Stitched Rectangle Dies by Kat Scrappiness. I used the two largest dies and then sprayed them with Sparkle Sheer Shimmer Spray. These were set aside to dry while I found some red cardstock in my stash and cut it with one of the Stitched Scalloped Nesting Dies by Kat Scrappiness. I dusted the edges with Black Soot Distress Ink, and also sprayed it with Sparkle Sheer Shimmer Spray. When this was dry I stamped my sentiments, using the Stamping Platform by Tim Holtz, with the exception of the word “naughty” using some Tuxedo Black Memento Ink. Because I was using the Stamping Platform I was able to emboss the sentiments using Versamark Watermark Ink and WOW! Clear Embossing Powder. I then trimmed down a bit of fun foam so that it was slightly smaller than the tag die. For the sentiment “naughty” I die cut the word out of black fun foam and black cardstock. The Gina K Black Onyx Cardstock is my FAVORITE black cardstock! I love that Kat sells affordable quantities of this. Getting back to the die cut, I adhered a bit Scor-Tape sheet to white cardstock and ran that through my die cutting machine with the die, then I removed the backing of the Scor-Tape and covered this in Nuvo Tonic Scarlet Red Glitter. I glued my black cardstock to my black fun foam cut using Ranger Multi Medium Matte, the fine tip applicator made this SO much neater and easier! I also used the same products to adhere the now glittered die cut to the black cardstock, however, I offset it a bit so that it would look more like a shadow. Using Scor-Tape, certainly skinnier than the sheet I used earlier, I started to layer my rectangular papers, because of the shimmer spray some of the edges curved up so I needed to glue them down with some Ranger Multi Medium Matte. I took some silver ribbon I had and fed it through the tag, but because my ribbon was so thick I tore part of my tag. OOOPS! 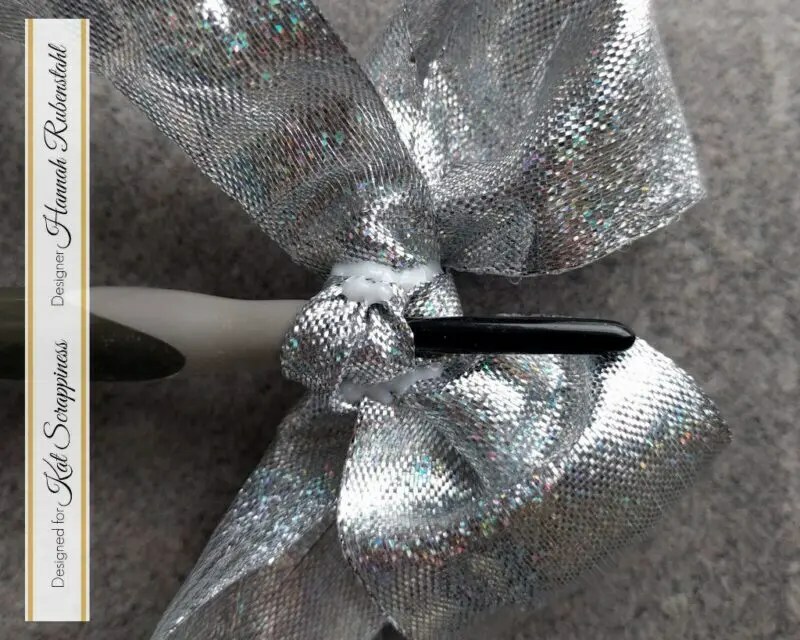 To fix this I tied a bow for my ribbon around my paper piercer and glued the back with more Ranger Multi-Medium Matte. I let this sit overnight. 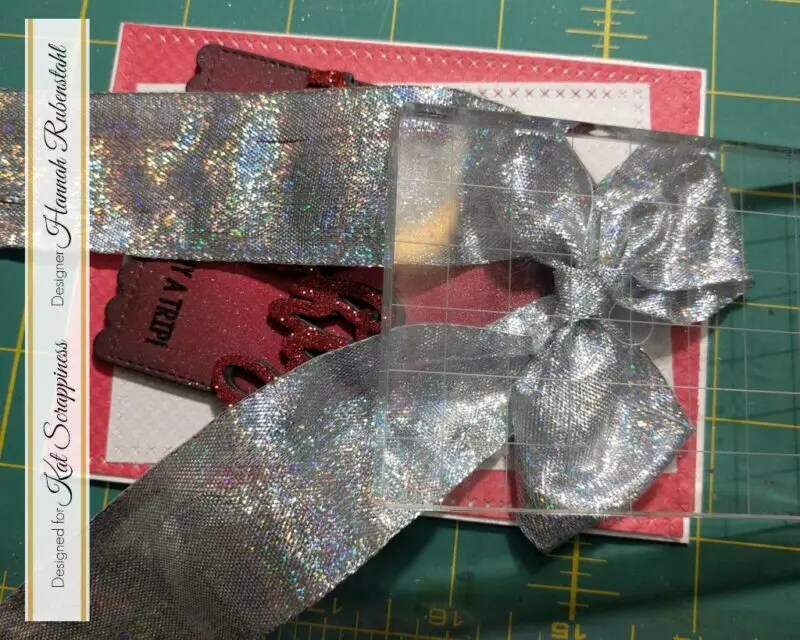 Using more Scor-Tape I adhered my tag to the card and I used yet more Ranger Multi Medium Matte I adhered my silver bow to the tag, this I had to weigh down with some of my acrylic blocks. And once that bow was dry, I had a finished card! Isn’t it super fun?!?!?! Your card is absolutely gorgeous !! Great job ! !